June is quite an important month for the Philippines. We celebrated our Independence Day on June 12 and today marks the 154th birthday of our national hero, Jose Rizal. But how is this related to books in any way?? 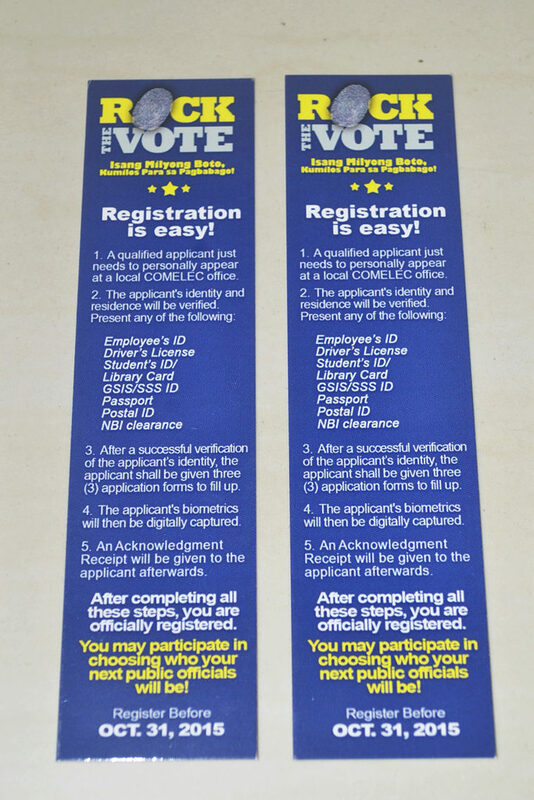 Aside from the fact that elections are quite important and affect us all, many organizations and government offices are also giving away this Rock the Vote bookmark. It lists down the steps on how to register for the coming election and when the registration closes. Here’s a list of good reasons why you should vote! This is from Voting Counts organization in the UK (who recently had their general elections last May). Nonetheless, it’s applicable to us as well. Let’s take advantage of living in a democratic country. We have the right to vote for whoever we want to in free and fair elections. Voting gives Government legitimacy. This means they have the people’s support to make decisions. The more young people vote the more likely politicians are to make policies that benefit us. Every vote is important so many politicians are inclined to try and do as much as they can to help and win your votes. The Suffragettes spent years campaigning to give Women the vote. Many even gave their lives, let’s not waste it! Voting gives you the power to choose how the country is run. If you have a complaint about the way the country is being run, you can choose a candidate whose platform you believe in. Your local officials can help fight important issues for you. Voting for them can help them keep their jobs and continue their positive work in your community. You can leave your ballot blank. If you don’t agree with any of the parties/candidates you can leave your ballot blank, it’s a much more effective protest than not voting at all. It only takes a few minutes and it’s really easy!